With so many games being released each year, it’s easy for an indie title to fly under the radar. You’d be forgiven for missing RAINN Studios’ War of Kings when it Kickstarted back in 2014. It earned a modest $46,000 and change then, but three years later, the game has less than 50 ratings on its Boardgamegeek page. It’s a shame the game is mired in obscurity as co-designers, and brothers, Heath and Seth Robinson have created a game worth noticing. 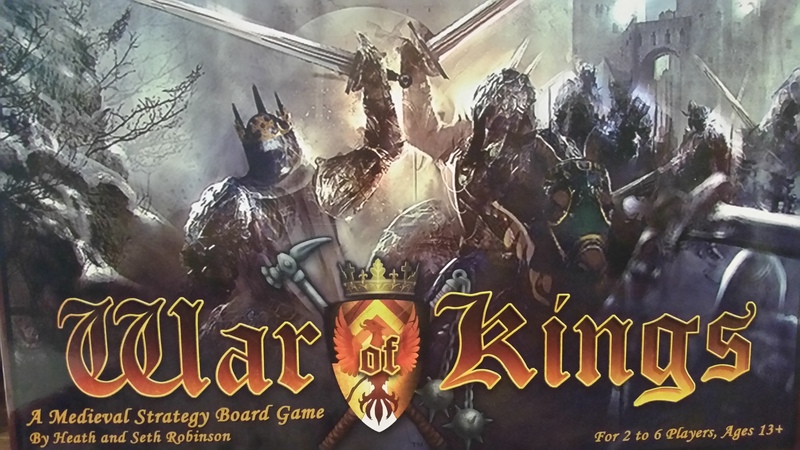 War of Kings pits two to five players against each other in a quest to dominate the land of Arowyth, which has been thrown into chaos under a power void. You can choose to play on either side of the reversible game board. One is the lush temperate zones of Arowyth while the other is the harsh winter landscape of the ancient Arowythian Empire. There’s little difference other than the wonderful aesthetics, but the starting positions do vary. Both map board sides are divided into a few dozen areas which contain the timber, wheat, cattle, and stone that will feed and build your kingdom. Areas contain a colored primary resource and a greyed out secondary resource. Which resources are collected are determined by rolling three colored dice. The colors that appear let you know which colored primary resources to collect. For example, rolling a blue, red, and green on the dice will allow you to collect resources from each blue, red, and green area you control. Rolling more than one color allows you to double your gain from any corresponding colored area. Custom dice are used for everything in the game, from resource collection to resolving battles. How much of the resource collects depends on the size of your settlement. Minimal gains come from merely controlling the area. From there, you can increase your income by building a village, then a town, and ultimately a city. Building towns and cities also unlocks an area’s secondary resource, making your province extremely valuable. They also provide gold as income which is used to needed to buy anything used in the game. If you ever find yourself short of resource you need, the game allows open trading between players. Trading partners negotiate their own terms. In fact, the game is fairly open when it comes to player interaction. There’s nothing stopping you from trading, creating alliances, or negotiating peace. Your fledgling kingdom begins with a town, a village, four areas under your control, and a lone army. You’d be amiss if you assumed War of Kings was just another game of gobbling up as much territory as possible to win the game. Territory is important, but it’s your ability to manage resources and create a thriving infrastructure that will ultimately determine your success. Victory comes from being the first to amass 13 achievement points, which are earned by building cities. The settlement miniatures are wonderfully sculpted, as our the fortifications that protect them. Constructing said cities is an arduous task. Each level of settlement can only be built once per turn. Theoretically, you’ll need at least three turns to create a city, since it must first be built up from village, then into a town. However, the amount of resources you’ll need takes planning. Expanding territory is useful to ensure you have the resources needed to build, but it expanding too far can leave you vulnerable. Building armies allows you to expand your empire or conquer others, but in War of Kings, armies march on their stomachs. The number of armies your kingdom supports is directly aligned with the number of settlements you have. Armies can be supported while stationed in villages, and a small number can be support from afar if you have built towns or cities. Yet, for those armies to be supported, they must be connected to your capital city by a road network. Yes, even roads are a consideration in this game as armies cut off from the capital are unsupported and will require additional gold to maintain. Having too many unsupported armies can be costly, and this mechanic does a great job of making you think about how to best use your resources and when is the best time to strike. War of Kings is very much an opportunity cost game. Deciding how to protect your kingdom adds another layer to the resource management element of the game. Like settlements, there are three levels of fortifications that can be built to transform simple palisade walls into mighty castles. Again, these have significant resource costs, but they provide bonus defensive dice when an army approaches. The fortifications, as well as the settlements, are all done in amazingly detailed miniatures. When defensive buildings are placed, they fit right around the settlement you’re protecting. The game is nothing short of stunning once several players have started populating the map. Protecting your realm with fortifications and connecting it with roads are crucial to your success. Great games allow multiple paths to victory, and War of Kings does that. You could win the game and never once invade another player. Cities are worth three achievement points, so even the most modest empire can win by simply playing a defensive, resource collecting strategy. For those that lean more toward the warmongering side, you are in luck as well. Bonus achievement points can be earned for having the most territories, the most levels of fortifications, the greatest gold collector, or for the most conquered cities. Those can be some nice targets for more aggressive players. Armies are generic in War of Kings, meaning one army fighting another has no given advantages. Custom dice are used to determine the outcome of a conflict. Red attack and blue defense dice can hit, miss, or shield. The difference between hits and shields determines the damage inflicting on the opposing side. Bonuses dice can be added to the side with the most armies in battle or through fortifications that have been build. Battles are fairly straight forward affairs, and luck will ultimately play a large part in it. Throwing caution to the wind and attacking at even odds is just as likely to be a disastrous result as it can be a grand triumph. Don’t be surprised if, as you play, you start to wish that War of Kings had miniatures for their armies to go along with the impressive structures. Armies were offered at one point, but at nearly double the cost of the entire game. That’s a hefty sum just to bling out a game. Still, you’ll long for something more than tokens to push around the map. Nothing in War of Kings can be done without a little randomness involved. You roll event dice at the beginning of each turn. Usually, the result will allow you to draw event cards for your kingdom. These can add bonuses in battle, extra resources, or even negative effects to irritate your opponent. Before you can capture new territory, you must explore it first. Again, dice are used to determine what happens there, and that can range from finding resources or ancient roads to use to uncovering a marauding band’s village. Random marauder events can really wreck havoc with your plans. Marauders play a vital role in the game Not only can their villages or armies appear through territory exploration, but they may appear and even attack with the event dice roll. Marauders represent invaders from Malador, looking to capitalize on the chaos of Arowyth for their own gain. The Maladorians are controlled by their own deck, which comes up periodically during the event dice roll. If a Malador action comes up on your turn, you are temporarily in control of them. This means if asked to attack using a Malador army, you may be able to attack an opponent’s settlement or disrupt their road network, but there are times when you’ll be forced to attack yourself if you are the Malador’s lone neighbor. You may be able to predict your opponent’s move, but you’ll also need to be prepared for the unpredictable nature of the Malador. As you can see, War of Kings is a game based on a fair amount of randomness and luck. Dice control everything in this game, from what resources you get to how battles unfold. If you don’t like such volatility, this is not your game, but War of Kings wants it to be random. The Robinson brothers did a fantastic job of creating this chaotic world, and this chaotic world forces you to be prudent. It forces you to plan ahead and be prepared for sudden shifts in power. You learn to strike and expand when the odds are in your favor. You learn to stockpile and defend in fear of being caught spread too thin. The more random the game becomes, the more you’ll be thinking about how to plan. War of Kings wraps a generic war game around a surprisingly immerse resource management experience. The game rewards those than plan diligently, while its chaotic elements will ensure a variety with each play. The result is a deeper experience than you’d expect from a medium weight empire game.